The family suite at Banoka Bush Camp consists of two separate canvas tents on elevated platforms. Both rooms have separate entrances and their own bathrooms, with the children’s tent being a little smaller. 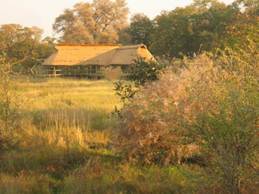 Since the camp’s opening, wildlife sightings have been excellent, including: pack of 14 African wild dogs with pups (a regular sight at the moment), herd of approximately 1 000 Cape buffalo, leopard chasing and catching a squirrel, pride of seven lion feeding on a young buffalo carcass, common waterbuck in camp, elephant and general game such as southern giraffe, red lechwe, spotted hyaena, common reedbuck and impala. The camp also recently ran its first cultural village trip for enthusiastic guests.